His father had said once, that the hardest choices aren’t between what’s right and wrong, but between what’s right and what’s best. The best thing was to let her go, and Henry had done just that, but his mind had filled with doubts. Henry is a Chinese boy living in Seattle, whose father makes him wear a button that says, “I am Chinese.” His father has worked hard to see that Henry can go to the elementary school, but he doesn’t really belong. Neither does the lovely Japanese girl, Keiko, with whom he develops an instant friendship. More than that, really, they have a deep bond which resides in Henry’s heart. When Keiko’s family must go with the other Japanese families living in Uwajimaya to Camp Harmony, Henry goes to serve food with the school’s cook, Mrs. Beatty, just so he can see Keiko through the barbed wire fence. He brings a sketchbook for her birthday, and a rare and valued jazz record of Oscar Holden playing “Allie Cat Strut.” It will be as if he is there listening with her, she tells him, and I’m reminded of how lovers who cannot be together grasp the smallest things through which to connect. This is an intricate tale of exquisite beauty; it tells of the Panama Hotel, World War II, Japanese and Chinese, fathers and sons, but more than anything, of Henry’s undying love for Keiko. It is a novel I won’t forget. Sounds lovely! Definitely a new title to add to my TBR list. Loved your summary of it – sounded interesting. Cheers! This looks like a very touching book. It's been added to my wishlist right away. The title is beautiful. So is your review and how you put their relationship together. "..and I’m reminded of how lovers who cannot be together grasp the smallest things through which to connect." I have been meaning to read this book for quite some time. Glad to hear it spoke to you, Bellezza! I'll get around to it this summer I hope. I've seen this on a few blogs, though only read about it here. It sounds very good, and although I'm not a huge fan, Lisa See's opinion there has sold it to me. This is going on my TBR list right now! It sounds wonderful. Now if I could just get through all the "end of the year, graduation stuff" so I could have more time to read!!! I was in Target one day and picked this book up. While it was not a book that I read at one sitting, I was very moved by the story. Having been little during World War II and hearing my parents talk about the war and all, it brought many things together. I was sorry when it was finished. I must go back and read it again. I loved the book. This book looks really good, and your review of it was beautiful. I listened to this one on audio, and it really was beautiful. Very predictable, but I forgave the author for this, because of its sweetness and delicacy! I was also horrified to learn about what we did to those poor people. I guess I missed that portion of my history lessons (I'm thinking they didn't tell us!). This sounds fantastic! I can't wait to read it. I really liked this one, too. I hope it's okay to link to your review on War Through the Generations. Your review is so concise and so beautiful. Your words really make me want to read this book. ooh, i've added this to my wishlist. thank you for the wonderful review! I loved this story as well, so it is always nice to read a positive review; glad u liked this one. I read this one about a year ago on a road trip to Washington although we didn't really go anywhere near the places in the book. 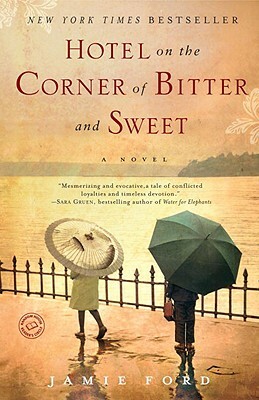 It was a sweet story, and perfect vacation reading! haha, i just had to comment on this. my aunt's name is Keiko and she is not sweet or pretty. she's actually kind of evil. Wow, what a lovely review. I really need to take this one down off the TBR shelf. Thanks! I see in the comments that this was your first audiobook! I'd love to hear about that experience–it's something that I'd like to do more often (since I'm in the car two hours every day) but have a tough time focusing on.I'm so glad you liked this one. It was a really touching story and bet it would be good to listen to. I just adore that cover.